The concept of Mental Health is not generally understood or discussed to any great extent by individuals, families, the media or society unlike physical heath. When an individual’s ability to cope and contribute to daily life is impaired this is a mental health issue. This is more common than perceived as one in four persons can experience a mental health difficulty at some point in their life. Stress, bullying, addiction, bereavement are some of the factors which can affect our ability to cope with daily life. Unfortunately people who experience mental health problems can feel very isolated, alone and misunderstood. It is this reality that motivated us to develop our partnership project ‘Healthy Reading, Healthy Mind’ . An appropriate book may not only suggest ways to manage problems but also reassure people that they are not alone. Reading can provide support, guidance, direction and empower the reader to work toward maintaining good mental health. 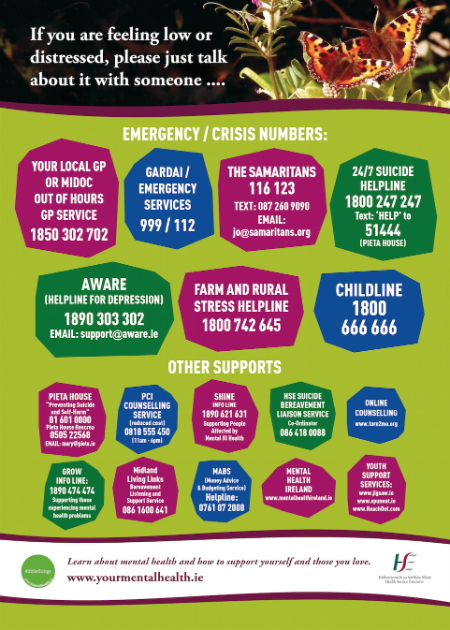 Help lines and websites can also be a source of support and help. These materials can also be beneficial for concerned family members and friends . Dennis Greenberger, Christine A. Padesky ; foreword by Aaron T. Beck. New York ; London : Guilford, c1995. New York, N.Y., : Plume, c1999. Irish National Council of AD/HD Support Groups is an umbrella organisation for the AD/HD Support Groups active throughout the country.